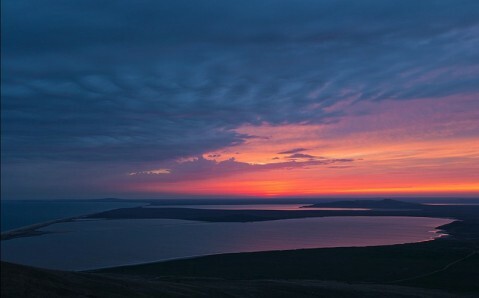 Located in the Opukske Reserve, in the Kerch outskirts, Lake Koyashske is one of the inimitable wonders of Crimean Peninsula. There are several unique characteristics for which the lake stands out. 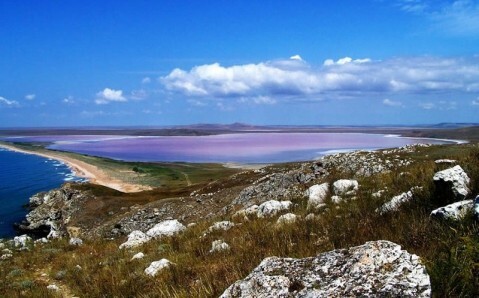 Lake Koyashske is considered to be the saltiest in Crimea – a liter of its water contains 350 grams of salt. Therefore, the locals were used to extract this popular mineral here. But the lake’s main highlight is its changing-colour properties that depend on season. 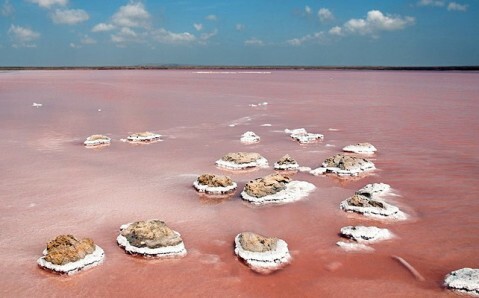 So when it's hot, the water is pink-coloured – creating fantastic scenery it sharply contrasts with the white shores and blue buzzing waters of the Black Sea. The main reason for such an unusual color of the lake is the microscopic algae that live there. They contain a special scarlet pigment in its structure that gives water such a characteristic color. 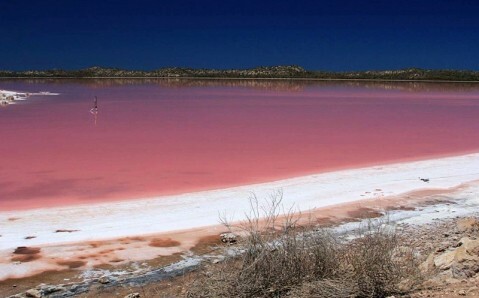 The other reason of lake’s red color is brine shrimps that also live here. The drier the weather, the more spectacular scenery Lake Koyashskoe has. The distinctive color of the water becomes more saturated. Therefore the water evaporates, the salt dries out and covered with small crystals stones protrude from the lake’s surface. On its margins, the white border appears – it spreads out and as a result covers the whole lake’s surface. 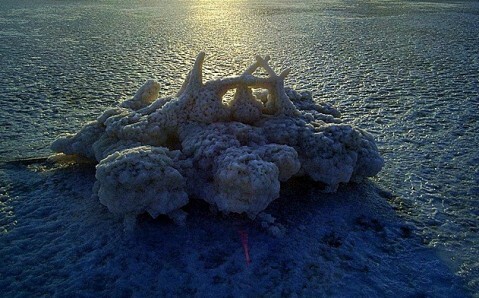 During this period, the lake bears a strong resemblance to the Martian landscape. It is curious that the lake is fairly small: it is only 4km long and 2km wide. Moreover, its maximum depth is barely one meter. Besides the landscapes beauties, Lake Koyashske is famous as a source of medicinal bars that don’t yield to the famous Saki bars in healing properties, and brine, known for wholesome characteristics. 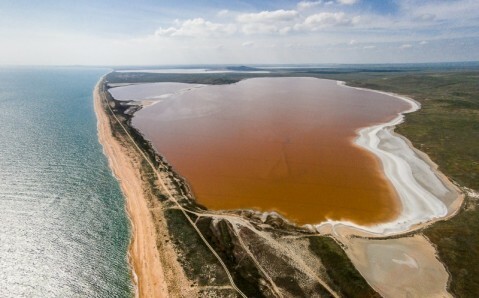 Stored at the lake’s bottom the silt deposits are considered to be 1.7 million cubic meters. In addition to natural resources, Lake Koyashske boasts other treasures. 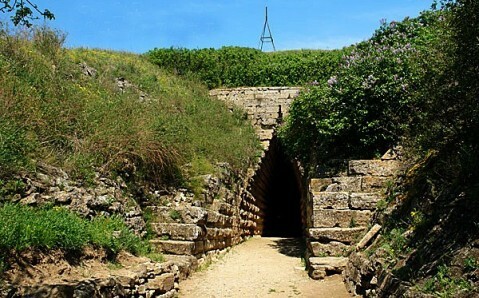 During ancient times, the ancient town Kimmerik was set on its territory. There are many artifacts as citadel, defensive walls, altars, sanctuaries, ancient aqueducts, wells that bear historic testimony of the town. How to get there. 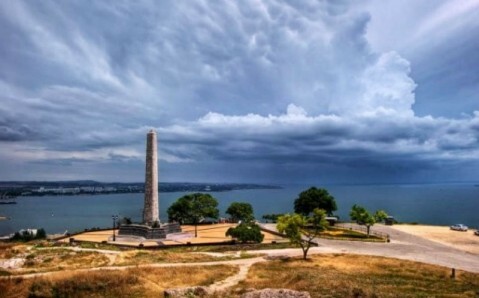 You can reach the lake in buses, which set off from Kerch for Yakovenko or Marievka. Walk around 5km from the route terminus.